Finding out that someone has been watching or listening to you and has potentially raised your level of security risk is scary. But, if you act quickly, you can reduce the risk and regain both your security and your privacy. The easiest and most effective way to do this is to hire professionals with bug sweeping devices to find and remove the bugs. Once you find a bug, the best thing to do is to contact a professional investigator with experience in counter surveillance. They will assess the damage that may be done by these devices and inform you of your level of risk. Following this, they will arrange with you a time to complete a bug sweep of the property. While it is possible to purchase the sweeping devices yourself, it is more efficient and sensible to hire a professional. One of the main reasons for this is because they will have the right tools and equipment for the job at hand. The sweeping devices used will depend on the type of bugs that have been placed. Most work on radio waves and can be found using a radio frequency detector. However, it is possible for these detectors to pick up on other objects around the home or office that use radio waves at the same frequency. Another device often used by private investigators during bug sweeping detects the lens of a hidden camera by the light that reflects off of the glass of the lens. These require a steady hand and patience as the lenses are small and easily missed by those not sure of what they are looking for. Hiring professionals to use bug sweeping devices is the best way to ensure that all devices are found and removed. At Advanced Sweeping, we only use the best counter surveillance technology to remove potential threats to your safety and security. 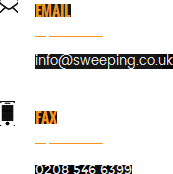 Find out more about the services we provide on our website, http://sweeping.co.uk/.